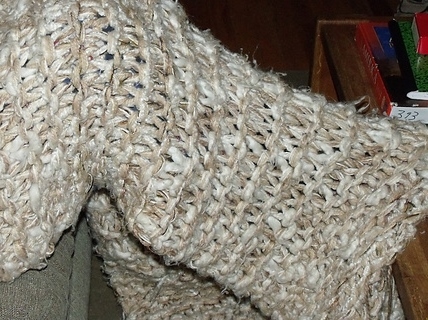 This is one of my all-time favorite knitting projects. You may think it looks somewhat old and ratty, and you’d be correct. It’s just well-loved. Actually, part of the reason is looks a bit beat up is because of one of the yarns I used, but more about that in a bit. I love it because it was really quick and easy to make. I made it when I was a fairly new knitter. I love it because it is super-warm and comfortable, but because of the construction, it breathes and I don’t get overheated. It’s based on an article in the February 2008 issue from Knit ‘N Style by Leslye Solomon titled They’re So Big!!! about knitting with large needles. This afghan was made with 7-9 strands of yarn knitted together at once, using 500-600 yards of each yarn. I cast on 36 stitches and worked in garter stitch. Whenever I got tired of any one yarn, I cut it and tied on a new different yarn. My fancy system of keeping the yarns from tangling was to place each ball of yarn in a Ziploc bag, cut off one of the bottom corners, run the end of the yarn through the resulting hole, and seal the bag. My rule in purchasing the yarns was that they needed to be white or off-white. Since I really knew nothing at the time about different yarns and their characteristics, it made shopping pretty easy. Yarns used included these (and I imagine many of them may now be discontinued): Bernat Satin Sport Solids, Lion Brand Moonlight Mohair, Lion Brand Jiffy Solid, Lane Cervinia Le Fibre Nobili Imperiale, and Bernat Soft Boucle. I also used something resembling thick and thin roving – but I have no idea now what it was. That was the yarn that pills so badly – but it surely did make the blanket warm and cushy soft. I also remember buying a yarn that was a raw silk blend. 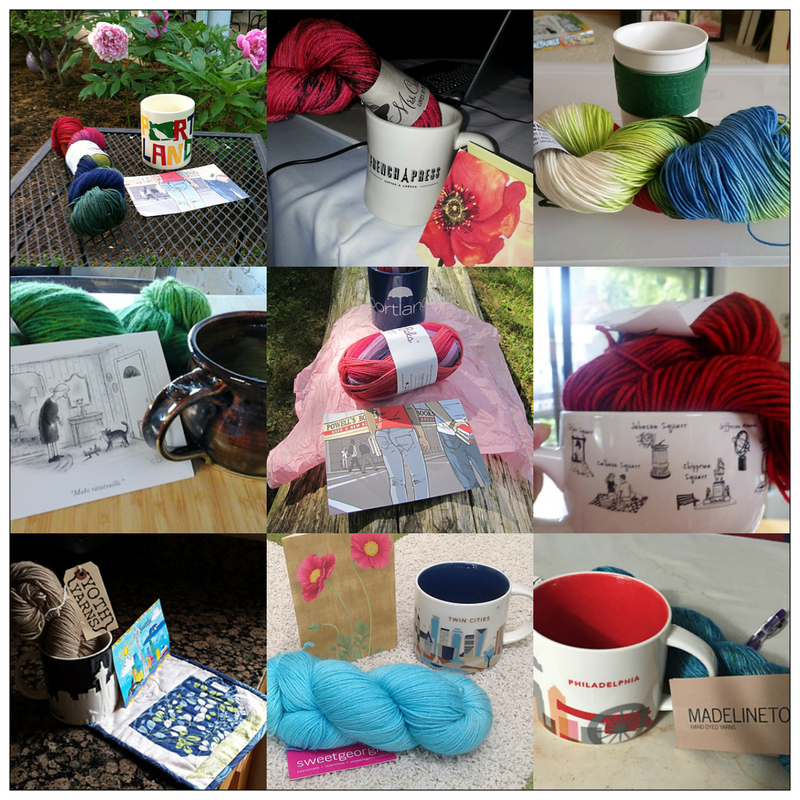 There’s not much more information on my Ravelry project page, but here it is if you’d like to take a look. I really do love this afghan and sleep under it every night. Using size 50 needles (25 mm) was a kick in the pants! Working in garter stitch and changing out just one yarn at a time made things pretty easy. Changing a yarn when I started to get bored kept the work interesting. It’s definitely something to keep in mind if you’re looking for something unique and different to make! P.S. For reference, the largest needles in the photo are the orange needles, which are size 35 (19 mm). Size 50 needles are BIG!!! That’s amazing how you held that many strands together. I can understand why it lasted so long. Thanks. And it was fun! I used the same size needles to make a blanket once, but my aging hands couldn’t take it! Something in the way I held the needles, I guess, but it hurt so much I had to stop using them and gave them a younger friend. I also gave her the blanket…not sure what I was thinking!! !